The Honda Civic will be available with a new 1.6 i-DTEC engine from January 2013. According to the claimed official figures the new diesel averages 78.5mpg with CO2 emissions of just 94g/km meaning zero VED and exemption from the central London congestion charge. Prices will start at £19,400. 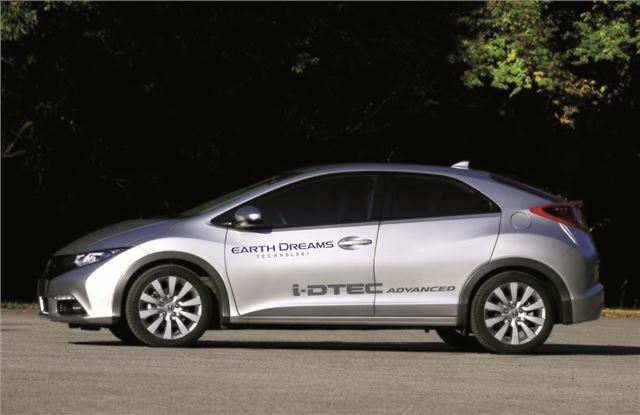 The smaller i-DTEC engine joins the impressive 2.2 i-DTEC along with the 1.4 and 1.8 i-VTEC petrols in the Civic range. Developed for Europe, the engine is part of Honda's ' Earth Dreams Technology' programme and will also be available in the new CR-V later in 2013. It comes with a six-speed manual gearbox as standard. Despite the smaller size, the new engine has impressive figures with with 120PS and 300Nm of torque. The 2.2 i-DTEC isn't that much more powerful with 150PS and 350Nm. However its lower price and low CO2 figures will mean it will be a popular choice for company car drivers. Prices will start at £19,400 for the SE model, £20,595 for the ES and £23,175 for the top-of-the-range EX. Specifications will be identical to the equivalent 2.2 i-DTEC, but with the addition of new 16-inch alloy wheels. The 1.6 i-DTEC EX has also been enhanced with front and rear parking sensors, an auto-dimming rear view mirror and DAB digital radio.